Project Stream, a long-rumored service that Google formally announced last week, is most obviously comparable to NVIDIA’s GeForce NOW. It uses remote PCs in Google’s enormous data centers to stream video of high-end games to thin clients running on the desktop Chrome browser. Windows, macOS, ChromeOS, it doesn’t matter—the system works the same. The input from the player’s mouse, keyboard, and/or controller is transmitted back to Google to play the game in near-instant real time. The advantages are obvious: players no longer need $1000+ gaming PCs to get access to the latest games running at the highest graphical settings. In fact, this kind of connection enables playback on more or less anything, assuming you have decent internet speed with low latency. Mobile gaming with this setup is certainly possible, though Google hasn’t enabled it for Stream yet, and high-speed Wi-Fi is much more conducive to low latency connections than even the best LTE. The Stream beta is open in the US to anyone over the age of 17, though it’s testing at the moment and you’ll have to wait for an invitation. I signed up for it immediately and got in. 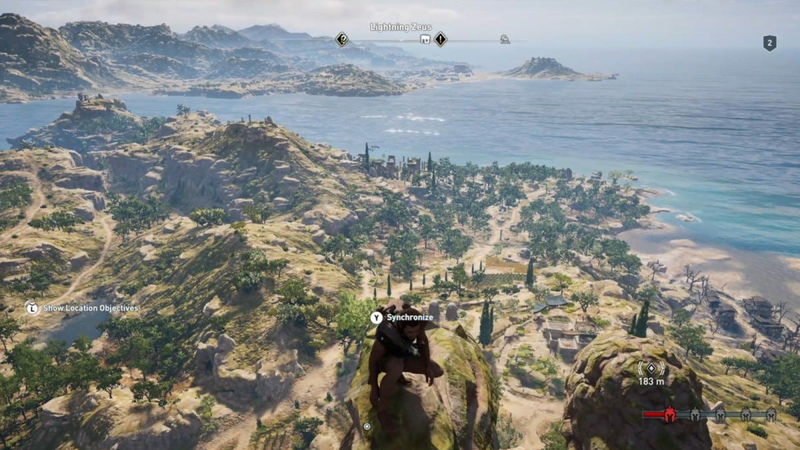 Right now Assassin’s Creed: Odyssey, the latest game in Ubisoft’s long-running series, is the only title in the test. If that’s a bummer, console yourself with the fact that it’s free. 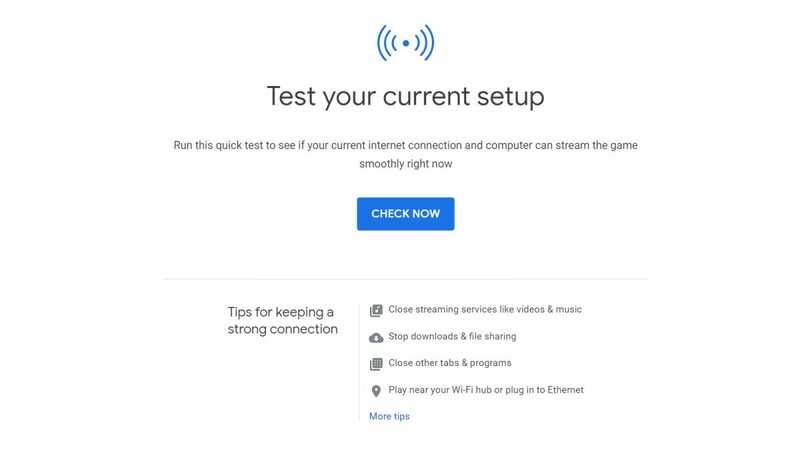 Google will test your internet connection before each Stream session. Trying out the service is as simple as opening a page in Chrome. Before each session Google will test your connection to make sure it’s fast and wide enough to play. Google requires 25mbps minimum, and I checked it out on my home connection, a fairly reliable 100mbps with about 30 milliseconds of ping. Once your local connection and speed pass the initial test, the game boots up in a fullscreen interface, as if it were running on your local PC. The presentation is impressive. Once the fullscreen window starts, you can’t really tell that the game is playing on a data center perhaps hundreds or thousands of miles away. The only difference from a AAA game running on my gaming PC was that it wasn’t taking full advantage of my 2560×1440 monitor set to 120hz—I’m assuming that the connection tops out at 1080p and 60 frames per second. Still quite good, and as much as most people use for console-style gaming. I did notice framerates dropping into the 40s on a few occasions. Controller support is fully integrated in a very impressive way, too. 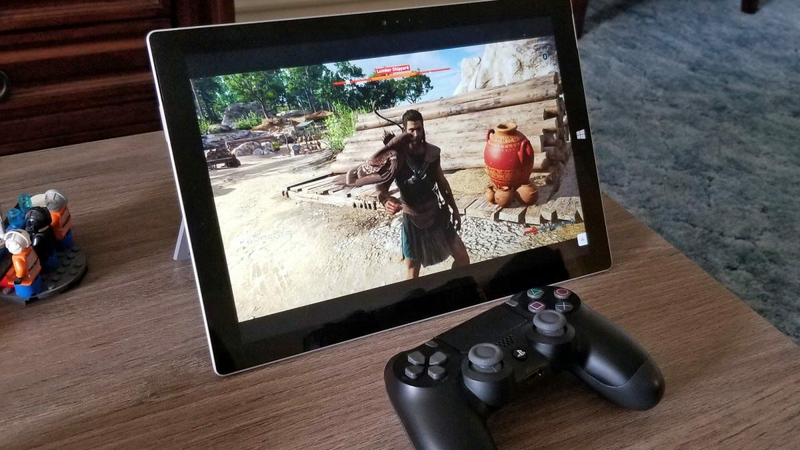 Like a properly-coded Steam game, Stream automatically recognized my Xbox One controller connected to my PC, and Assassin’s Creed adjusted the on-screen interface based on whether I was using the controller or my keyboard. Once I got into the somewhat derivative opening sequence, I could forget that I was playing on a hyper-sophisticated remote connection. Sure, it wasn’t as fast or as smooth as my meticulously-maintained gaming PC is capable of delivering, but for something played on a browser it was amazing. But playing Stream on a gaming PC with an Ethernet connection is defeating the purpose, right? So I loaded up a more nimble test, using my dusty Surface Pro 3 and a PS4 controller in my living room, three walls away from my Wi-Fi router. I was surprised to find that, not only does Stream support the PS4 controller (still somewhat iffy in vanilla Windows), it correctly identified it and adjusted the in-game interface to use the correct button icons. Well done! Stream can also pick up a paused session without needing to reboot the game, at least within a few minutes. You’ll be able to move from a desktop to a laptop, and maybe beyond, with barely a hiccup. Note: I had to take video to capture these screenshots. The quality of the live streaming is much better than you’re seeing here. Playing on the smaller, lower-resolution screen made the graphics pop even more. Despite the more iffy connection, I didn’t notice any significant rise in lag during a short session. I was still able to fight and respond in plenty of time to the game’s events. Though this is an early test, it’s already doing very well; under ideal conditions I could see Stream working fine on a low-end phone or even a Chromecast. Under less ideal conditions, the cracks started to show. While I snapped a few photos with my phone—since the control routing doesn’t allow for easy screenshots, at least at the moment—I noticed the game’s resolution and bitrate dropping dramatically as Dropbox synced the photos over to my PC via the local Wi-Fi. I kept it up and tried to play at the same time. Smartly, the system seems to prioritize a fast, lag-free connection over visual fidelity. While the graphics became increasingly fuzzy and muddy, the response from my controller never wavered. I saw the same results when I loaded up a huge Steam game download. Getting the best visual performance is going to require a network environment free of obstruction, not unlike streaming a 4K movie. It’s a promising start. Google clearly has a very good handle on the technical side of Stream, much more so than I would have guessed from a company only barely connected to the larger gaming industry. And speaking of the industry, that’s going to be the special sauce that this service needs if it’s going to be a success when and if it graduates to a larger rollout. 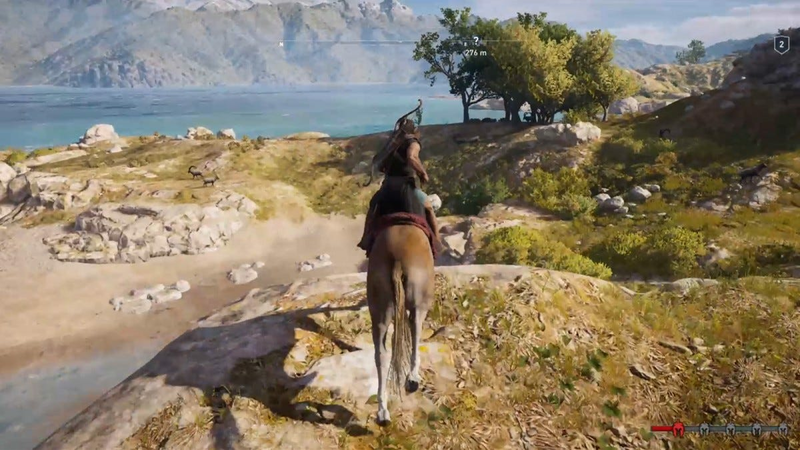 Like any platform, Stream will live and die on its selection of games. Sony, and possibly Nintendo and Microsoft in the near future, are banking on their industry connections and massive back catalog of games to make their streaming services compelling. With a PC-based system, Google will need to negotiate with each of the major publishers in order to get them to hop on. In this arena, Google has an advantage over NVIDIA (which already has several hundred games streaming on the beta GeForce NOW) thanks to deep pockets and an enormous potential pool of customers via Chrome. Ubisoft is on board, obviously. 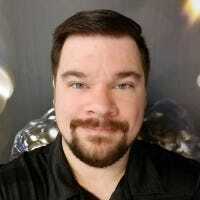 But with game streaming being the hot topic, publishers with their own massive data resources like EA, Activision-Blizzard, and Valve may prefer to roll their own services and cut up the market into more controllable, profitable segments. But that’s Inside Baseball. If you’re wondering if Project Stream is worth checking out, the answer is yes, assuming your home internet connection is up to the task. 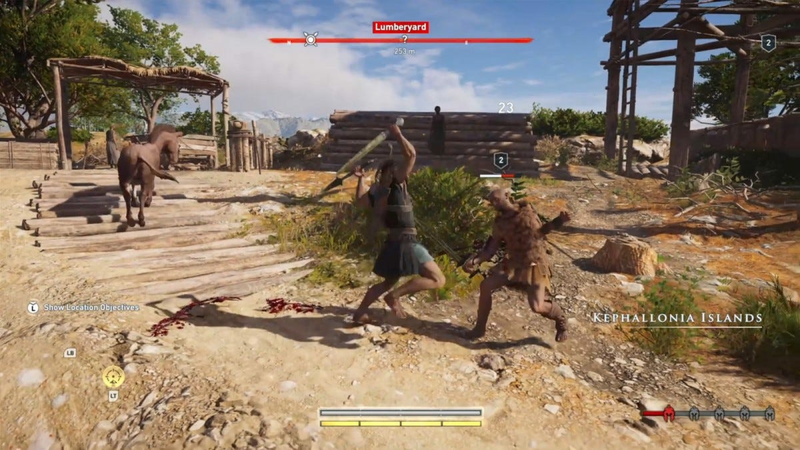 Assassin’s Creed: Odyssey is free on Stream for the testing period, which lasts from now until January. You can sign up for the beta here. You’ve made the first step, and you’ve signed up for a gym membership. Well done! Now to make sure you head there regularly and get the most out of your workout. We’ve looked at the best gear and accessories for you to take with you on your new journey to becoming a gym addict.